The Dees dominated the opening quarter with all of the play but their inaccuracy in front of goal let them down. They had great execution of kicks from their back to forward half of the ground. The Dees pressed hard and their disposals were top class in the first quarter. A strong run down tackle was applied from Kate Hore to Tiana Ernst. Hore to Elise O’Dea who kicked to the top of the goal square and Tegan Cunningham marked strongly late in the opening quarter. Cunningham converted the Dees first goal of the quarter from the set shot and the first major of the match. The Dogs did not have the ball inside their forward 50 at all. The Dees led by 11 point at quarter time. In the second term, the Dogs came out all guns blazing outscoring the Dees four goals to one. They opened the scoring in the second term off the boot of their co-captain Katie Brennan from the set shot. It was an exciting contest in the second quarter, as both teams gave it their all. The Dees gave away a free kick to the Dogs, as they threw the ball and Maddy Gay did not give the ball back to the Dogs properly and Dogs were awarded a 50m penalty. It was a handy 50m for the Dogs, as Bonnie Toogood kicked to Naomi Ferris who was at the top of the goal square and she marked the ball. Ferris nailed through her first ever AFLW goal. It was creative play from Aleisha Newman who set up her teammate Karen Paxman who kicked the goal nicely on the run. A nice long kick inside forward 50 and Isabel Huntington marked the ball over her opponent’s head. Huntington from the set shot kicked the ball but the ball fell short and into the trusty hands of Aisling Utri who took a solid contested mark near the goal line. Utri put the goal through the middle. A good kick from Kirsty Lamb into space for Irishwoman Aisling McCarthy to run into and she kicked the Dogs fourth goal of the second quarter. The Dogs had a goal advantage at the main break. It was a highly entertaining third quarter with both teams applying immense pressure and intensity in and around the contest. Lamb was tackled after she kicked and Kirsty McLeod was paid the free kick downfield. McLeod scored the Dogs fifth goal of the match and the first of the third term. 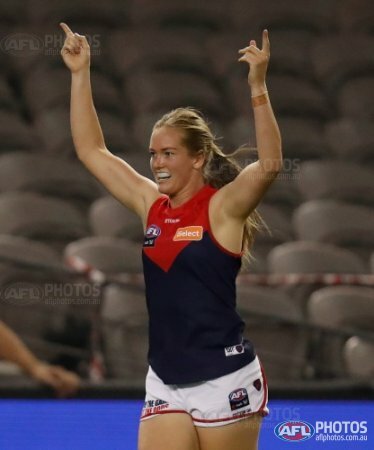 The Dees responded with a quick goal from Maddy Gay shrugged the tackle out of the pack and booted through the bouncing goal whilst under pressure. Newman applied a superb rundown tackle on Hannah Scott inside the Dees forward 50. Maddie Gay kicked to Eden Zanker. Zanker put through a great goal from about 40m out on the boundary line. The Dogs led by a point at three quarter time after the Dees scored two late goals. There was an impressive tackle from Utri who was given the free kick and Huntington took the advantage, as she kicked to Monique Conti who ran into space and kicked the running goal whilst being tackled in the goal square. The Dogs placed significant pressure on the Dees with their strong tackling and stood up to the Dees pressure late in the match. Cunningham scored a much-needed goal late in the final stanza executing the set shot. In a pulsating contest all night, the Dees came away with the one point victory over a courageous Dogs side that made them earn it. This win keeps the Dees finals hopes alive this season.